The time spent shooting high school sports and now the Syracuse Orange (see my reel above) has landed me some exciting opportunities with ESPN. It all started with an email to the CitrusTV sports director from a crewing company called Kwokman Productions. Kwokman was looking for utilities on the ESPN2 broadcast of the Syracuse/Minnesota football game in the fall (yes, apparently we still have a football team...), and I was quick to jump on the crew. Several CitrusTV members and I helped the cart-cam unit, which could drive along the sidelines with a raised platform that had a camera on it. A few of my other friends from CitrusTV held parab mics (the big plastic semi-spheres you see around the field for any football broadcast). Here's a goofy picture of me on the sidelines. It was fun, and just the start for a good relationship with Kwokman and various ESPN operations producers throughout what's been one of the best basketball seasons for the Orange. I've had the good fortune of working on every single ESPN or ESPN2 broadcast out of the Carrier Dome this season. Generally speaking, a utility helps the camera operators with whatever they need with setup, strike (breaking stuff down and putting it away), and during the broadcast. During setup and strike, I've worked a lot with the operators of the Fletcher robotic camera operators - the cool remote controlled cameras above the hoops. One of the operators who comes to 'cuse a lot and is an alum from the '70s has even worked with my dad, aunt and uncle - it's a small world. During the broadcast, I've mainly tended to the cable for handheld operators. Usually this entails sitting baseline, under one of the baskets in a coveted blue ESPN vest and whenever the camera operator moves making sure he has enough slack to get to where he needs to be and making sure no one trips over the cable. It can get pretty tricky during warmups when there are a lot of people on the court and during the game when we head into the crowd to get bump shots - those short little shots you see before the broadcast goes to a commercial break. Probably the most exciting broadcast to work on was the Syracuse/Villanova game on Feb. 27. The game broke Syracuse's on-campus attendance record as 34,616 fans filled the Carrier Dome. Fans had camped out on the concourse of the Dome starting on the Wednesday before the Saturday game. CitrusTV News provided live coverage from the Dome on Friday. With a simple iChat connection back to our studio across campus, an A-block story, teases throughout the broadcast, the weather forecast (they even let me in front of the camera), and half of sports block were all live from the Dome. We had two cameras streaming back: one from the concourse where the campers were lined up and one of the court where the team had been practicing. Finally, Saturday was game day... and not just any game day, it was College GameDay on ESPN. The pre-game broadcast brought several cameras, a news desk, interview sets and ESPN's top talent onto Jim Boeheim Court. Everything led up to an exciting game - not to mention a pretty enjoyable assignment for me. During the broadcast, my job was to follow sidelines reporter Erin Andrews around with a battery-powered 1x1 foot LED LitePanel to hold up whenever she was on air. Not a bad job. The Orange's journey in the NCAA tournament was cut short with the loss to Butler in the Sweet Sixteen, but my experience in sports TV production carries on. 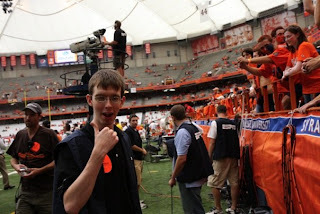 As Syracuse lacrosse season is in full swing, I'm still on the producing team for CitrusTV's Orange Press Pass, the only live post-game TV show for the nation's best lacrosse team. This month we'll also be producing a play-by-play broadcast for a women's lacrosse game for SUper Sports, a joint production of the Orange Television Network and CitrusTV. For OTN I work as the Engineer in Charge (EIC) for SUper Sports, overseeing the four-camera shoot and fly-pack control room. Last week director for NBC Sports Drew Esocoff was in Syracuse to teach a one-credit elective course on sports directing. Esocoff has directed Sunday Night Football for years. For the Olympics, he did swimming in Beijing and snowboarding and the closing ceremonies in Vancouver. 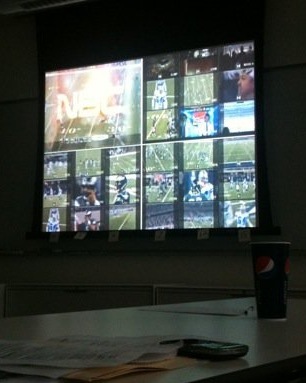 He also directed the Super Bowl in 2009. Check out the photo below to see what the typical class was like... watching his monitor wall, hearing his commands and talent, and using a laser pointer to pick what shots we liked best. What a cool teaching tool. What's next? This summer I'll be in Bristol, CT at ESPN's headquarters completing a studio operations internship. Disclaimer: Any information and opinions in this blog post and throughout my Web site are my own and do not necessarily represent ESPN, Inc. or the Walt Disney Company.